For the past year, I’ve been focusing my research on the power of networked resources. I’ve written blog posts that have demonstrated how both companies and individuals have used digital network technologies to innovate, solve problems, or even spread marketing messages. In each case, I’ve tried to quantify the monetary value created through such access. Last week, I experienced an “Ah-hah!” moment after reading a MarketingProfs article that demonstrated the monetary value a story can add to cheap knickknacks. The goal of the Significant Objects experiment wasn’t to mislead. According to its rules, misleading would have voided the test. Instead, the experiment involved writing knickknack-inspired stories that future owners could appreciate and therefore pay a premium. According to the website, the experiment “…sold $128.74 worth of thrift-store junk for $3,612.51,” simply by attaching a story to each item. Doing the math, storytelling increased the average monetary value of each object by 2,806%. I’ve always known that these cards carried some monetary value. A quick glance at eBay reveals that their average price tag is about $5 per card, bringing the stack’s estimated value to about $500. However, after reading the results of the Significant Objects experiment, I considered the upside of adding a story to the collection. Would it be possible to increase the stack’s value twenty-eight fold too? Could adding a story to these old postcards increase their total value to $14,000? What if I told you that the majority of these postcards were addressed to a woman named Elizabeth who lived in the greater Boston area over one hundred years ago? What if I told you that the cards contained clues to her life? For example, we know that she was married but we don’t know much about her husband. We know that she had a son named Eddie, she worked at a Boston-based Cigar Factory, and she vacationed on Peaks Island in Maine? Do any these tidbits make the postcards sound a little more interesting? For twenty thirty years, I’d always viewed this stack of postcards as antiques to be sold-off piece-wise. However, after transcribing ninety-nine postcard messages and entering them into a spreadsheet last weekend, I saw them as something very different: a century-old mystery. I wondered. Who was Elizabeth? What was her life like? Did she have to work in a Cigar Factory, or was it her choice? Who were Nellie, Sadie, Annie, Frank, Ella, Tom, Joe, Ruthie, Margaret, Debby, Mamie, and Kathryn? Why did so many of the messages end with “give my love to the girls?” Who were they? Her daughters? Her sisters? Something more…hmm…interesting? Could a mystery centered around a woman who lived a century ago multiply the monetary value of these cards? Could the story become a book? A movie? Or, what if the story was less about Elizabeth and more about a quest to eventually return these cards to Elizabeth’s family? Would you watch a documentary of such a quest unfolding? If we published all of these postcards online, could we harness the power of the network to help solve this mystery? Would participants from around the globe be willing to use the resources available to them to collectively piece together Elizabeth’s story, with the ultimate goal of delivering it with her postcards to her great-great (great?) grandchildren? Last week, Paul Gillin wrote a blog post called Lemmings with Microphones, where he questions’s the value of large-scale journalistic investment in covering both the Republican and Democratic National Conventions. He argues that with the state of today’s communications technologies, 15,000 journalists spending $30 million are not needed to cover the event. Gillin, who has been chronicling the collapse of the newspaper industry since March 2007 in his Newspaper Deathwatch blog, questions the mass media’s use of their precious business resources. The blog post got me to thinking about the changes in how live event coverage is changing in lieu of the digitalization of content and the socialization of networks responsible for distributing that content. Back in the 1960s & 1970s, coverage of a NASA rocket launch required expensive communications networks, thousands of people, and millions of dollars to deliver the event. Today, the average person with a smartphone can broadcast remote video–live, for the cost of their data plans. Through services like Google+, they can broadcast live video for the cost of their monthly Internet access charge. By virtually eliminating the cost-to-broadcast-barrier, the power to tell your own story has been wrestled from the grips of the few and placed into the hands of many. Take NASA for example. In 2012, they don’t need mass media to tell the full story of Curiosity. With the ability to broadcast live Martian images directly to anyone with Internet connectivity, they are no longer beholden to the limitations of prime-time, drive-time, or late-night television programming. It’s time for companies to consider the communications technologies available and the stories that they want to tell through them. One of my favorite examples is Digikey’s Another Geek Moment videos. Digikey is one of the largest suppliers of electronic components. It’s using modern communications technologies to demonstrate products to the company’s highly technical audience. Another Geek Moment demonstrates the power that resides at the fingertips of every corporate storyteller. For example, consider the following video of a rocket launch. It essentially delivers all of the content that the mass media did for the Apollo rocket launches with one main difference. Rather than requiring thousands of people and millions of dollars, it was created by two guys, a handful of off-the-shelf-parts, and a cell phone. The video has everything: multiple camera angles, a “Cape Canaveral” (the launch site), and a “Mission Control” (the remote launch site). Check out Texas Instruments MSP430 Launchpad. Times have changed. Affordable communications technology is available for your company to tell its own stories. The question is whether or not it’ll choose to use them. Over the past six months, I’ve been studying how advances in digital media and networking technologies are affecting the corporation. Rather than focusing on the obvious benefits of social media (marketing and PR), I’ve been spending more time looking at their affects on other corporate functions. The model above is my first attempt at describing the new, networked company. The ring in the very center represents employees and their internal network connections. 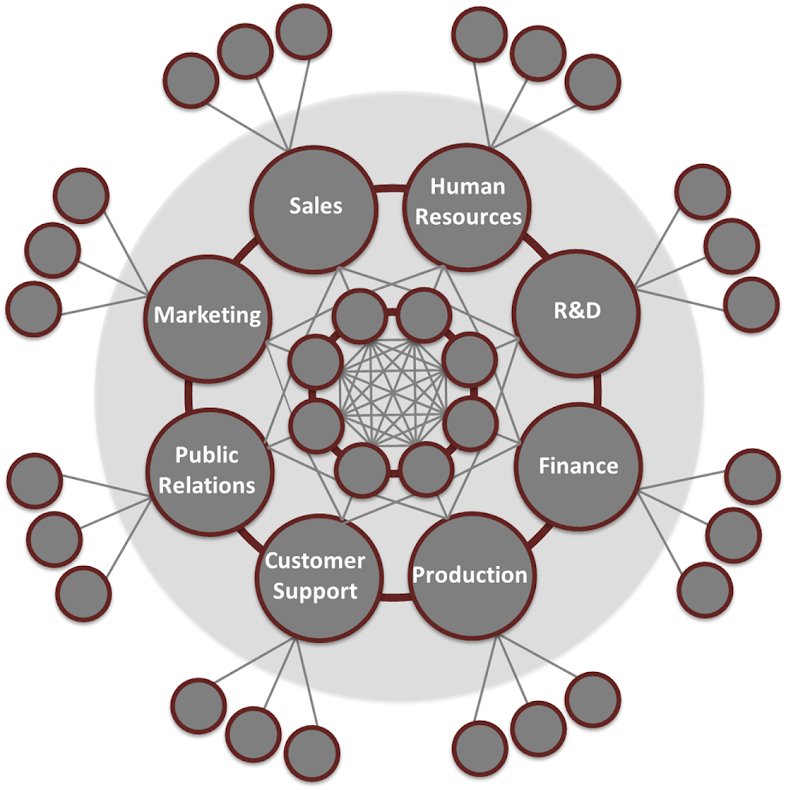 The ring of larger circles represents the various corporate departments/functions. The four departments on the left side of the chart (Marketing, Sales, PR, and Customer Support) represent “customer-facing” functions. The four departments on the right side of the chart (Human Resources, R&D, Finance, and Production) represent “non-customer-facing” functions. Networked Production/Product Development through technologies such as “additive manufacturing” (like 3D printing) or services such as Quirky. I’m now looking for your ideas. What are your reactions, comments, and thoughts about this model? What would you like to see to make it better?